It's just about following the tradition in our national politics and about going back on pledges made in the party's manifesto. Those who dream of a secular country have been more than surprised by what they term a misuse of religion in national politics. This recent decision by the ruling party has confused millions of Awami League followers who found it contradictory to the constitution of Bangladesh Awami League, which reads, "The fundamental principles of the Bangladesh Awami League shall be Bengali Nationalism, Democracy and Secularism." The 6th cabinet meeting of the year held on February 16, with Prime Minister Sheikh Hasina in the chair, decided to rename the establishments named after late president Ziaur Rahman including the Zia International Airport, which is to be named Hazrat Shahjalal (R) International Airport and Shaheed Ziaur Rahman University, Barisal which is to become Barisal University. It also decided to reinstate original names of the structures, which were changed by the BNP-Jamaat coalition government between 2001 and 2006. "According to the cabinet decision no structures or institutions will bear name of illegal autocratic ruler Ziaur Rahman following the High Court verdict regarding cancellation of the Fifth Amendment," Prime Minister's Press Secretary Abul Kalam Azad told reporters during a post meet briefing. "The verdict meant that the governments between August 15, 1975 and April 9, 1979 including Ziaur Rahman assuming power were illegal," he said. "The meeting argued that the international airport in Dhaka was named Dhaka International Airport when it was shifted from Tejgaon to Kurmitola in 1979." In fact, in 1983, the then government renamed it to Zia International Airport and Shaheed Ziaur Rahman University, Barisal, was named even later. "I don't understand it," is the only comment made by constitutional expert Dr M Zahir to The Star, in his reaction to finding a link between cancellation of the Fifth Amendment and renaming of the establishments. "Using the judgment to provide a legal justification of changing the name is clearly a politically motivated decision, which reflects a very nasty political rivalry that is not acceptable to most people in the country," comments legal expert Dr Shahdeen Malik to The Star. The Fifth Amendment was passed on April 6, 1979 by adding a new paragraph in the fourth schedule of the constitution that provided that "All amendments, additions, modifications, substitutions and omissions made in the period between August 15, 1975 and April 9, 1979 by any proclamation or proclamation order of the Martial Law Authorities had been validly made and would not be called in question in or before any court or tribunal or any ground whatsoever." "It can't be the way of showing respect to the Sufis, there are many other ways to do it," says journalist Shahriar Kabir." Renaming the airport in honour of a Sufi, Awami League, rather, proved that it is learning bad examples set by BNP. We condemned the renaming done by BNP-Jamaat government when they converted M.A. Hannan airport to Shah Amanat (R) airport in Chittagong. I also condemn Awami League led grand alliances' decision of renaming Zia International Airport to Shahjalal International Airport." "The trend is nothing but misusing religion as an expression of their vindictiveness. I wonder when a minister says that they don't want to keep the name of the international airport by the name of a 'killer'. Have they proved Zia as a killer in the chargesheet of the Bangabandhu murder case? Or has the court labelled him a killer? Without proving they can't make such sweeping comments just to hurt others. It's true that Zia did commit offences such as amending the constitution and proclaiming ordinances. But it is not fair what the ministers are doing or saying at present," he observes. Civil Aviation Authority has not yet estimated the total cost required for the renaming process, though many believe that it will take more than one hundred crore taka. "All the stationery need to be modified as per the new name. At present the name Hazrat Shahjalal has been added on a banner. The neon signboard and other structures need to be changed. Moreover, International Civil Aviation Organisation has to approve the new code name for identification and correspondence. And the new code has to be changed both manually and digitally by the airlines. Aeronautical signalling will also have to be changed. The whole process will take a few months," informs the Public Relations Officer of Civil Aviation Authority. According to Shahriar Kabir it is just a step to misuse money that could be used to improve the standard of the airport. He says, "I've learnt from a newspaper report that it will take a big amount needing into more than taka one hundred crore for effectively renaming the airport. Whose money are they spending to take their revenge on evil politics? With this money they could have done the renovation works of the airport to function as an international airport, something that is actually needed. And the airport is of international standard. The present airport in Dhaka could function for domestic use and the government should construct another international standard airport with a new name." The observations by the experts have been proven by some activities and statements of the government. On the day following the cabinet meeting the 'Zia' part of the neon signboard of the airport was switched off, although the cabinet decided that the decisions would come into effect with the government's official notification. Now, "Hzrat Shahjalal' part has been added on a banner. "Changing the name of just one or two structures has upset them; what will happen if we change the names of 250 structures?" said the Awami League chief at Bangabandhu International Conference Centre in the capital yesterday. "There are many ways to teach them lessons," says Shahriar Kabir, "the government can do it by proclaiming a secular education policy and by returning to the original constitution properly." The implication of a return to the constitution of 1972 will restore in the constitution the abolished article 12 and the original form of the amended article 38. The implication will also extend to the undertaking of effective measures as to the political abuse of religion and to the reconsideration of the existing scenario where the state supports a particular religion. nor Shaheed Zia, rather they are harming their own fortunes." Some other opposition leaders are screaming revenge, claiming the current government is not the last government and there are many governments to come. That implies, in the future the names of other important establishments might be changed to the names of the Sufis. 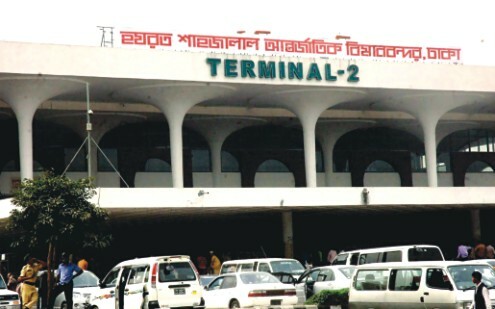 Already the airport in Dhaka has been renamed Shahjalal (R) International Airport, the airport in Rajshahi as Shah Makhdum (R), Shah Amanat (R) airport in Chittagong and Hazrat Khan Jahan Ali (R) for the under construction airport in Khulna.